Peter Kerr is a former jazz musician whose experiences with the popular Scottish trad band the Clyde Valley Stompers were catalogued in his previous book, Don’t Call Me Clyde. 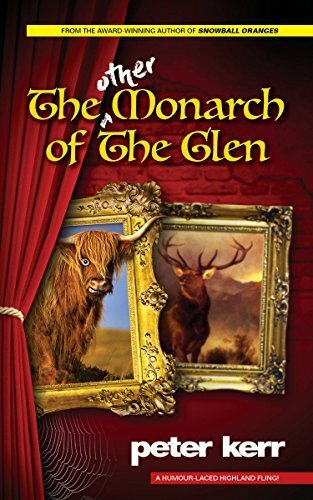 Now a best-selling author of fiction with a dozen titles to his name, he reverts to that genre with this enjoyably daft romp set in the Highlands of Scotland and featuring a cast of characters most sane citizens would want to give a wide berth. It begins in Edinburgh where the two main protagonists, apparently total strangers, encounter each other in Waverley Station and proceed to pick each other’s pockets. Unbeknownst to them, they and another couple who will shortly be fellow guests of the hapless Lord Strathsporran, are taking the same train to Inverness, and as the journey begins so too does a yarn of the sort that Tom Sharpe used to spin with unlikely event following unlikely event with an occasional pause for amorous (sort of) diversion. The interest for jazz fans might take a while to materialise, although this is a volume slim enough to be read at one sitting, but the humour and word-play Kerr uses will have been born, or at least further developed, during his days in the Clyde Valley Stompers band bus and is very jazz muso of a certain age in style. When the jazz element does emerge – the two leading characters turn out to be long lost brothers who had a distant musician-fan relationship without knowing their true connection – the effect is of Tom Sharpe’s Blott on the Landscape creating a love child with George Melly’s Owning Up. 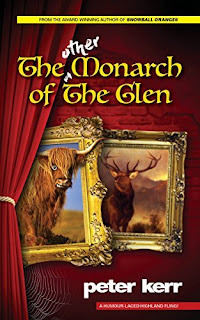 In terms of the plot, the jazz, like the younger sibling-chancer’s communion with Senga, the house maid, is subservient to the heist the re-acquainted brothers hatch when it transpires that Strathsporran has an heirloom, a sibling painting to Landseer’s The Monarch of the Glen, worth millions. And without wishing to give too much away, the jazz possibility returns – and not because they open a club with their share of the spoils. All in all a pleasingly bonkers read that sets a trap and makes you want find out what happens.